Lucas Oil products Now At Mr. Muffler! If you need a pick me up for your car or truck, we have just the products for you! We are carrying a new brand that will get you up and going with a high performance enhancement. We’re talking about Lucas Oil products, a company that has made a huge mark on the oil and oil products market since its inception in 1989. We found a few products that we think you will like and are currently on special. If your transmission has seen better days, or you want to extend the life of your current transmission, we highly recommend Lucas Transmission Fix. This non-solvent formula helps reduce the slip, rough shifting, and delay you can get with an old transmission. This product is 100% guaranteed to stop seal leaks in your power steering. Will also correct any issues you may have been having with rack and pinion problems. This formula is made for diesel and gasoline engines alike and contains zero solvents. This treatment is made to make your engine run at peak performance with extremely slick oils and additives. Less stress on your engine, more power behind it! This product will clean and lubricate your injectors and carburetor which will help you burn fuel more efficiently, giving all the added benefits of top performing engine. If you need a go to oil stabilizer, this is the product for you. This guy can be used on any type of vehicle, regardless of size. This oil stabilizer will help reduce oil consumption, help make your oil last 50% longer, and help increase power and MPG. Now at Mr. Muffler! Lucas Oil products are here and currently on special! 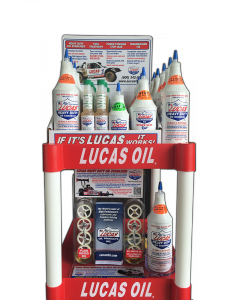 Take $3.00 off your next purchase of any of our Lucas oil products. So stop on in and get a tune-up!